I travel a lot and during long-haul flights, I plug into my vintage iPod for entertainment and usually listen to favorite audiobooks. Since engine noise can make listening difficult, I use noise isolating earphones. I’ve tried a borrowed pair of the big Bose earphones that cost about $450, and though they did a perfect job of delivering excellent, uncluttered sound quality, I decided against purchasing a pair due to their size and price. I did buy the company’s SoundTrue earphones for $130 from an online vendor—and subsequently returned them because the sound quality wasn’t great. 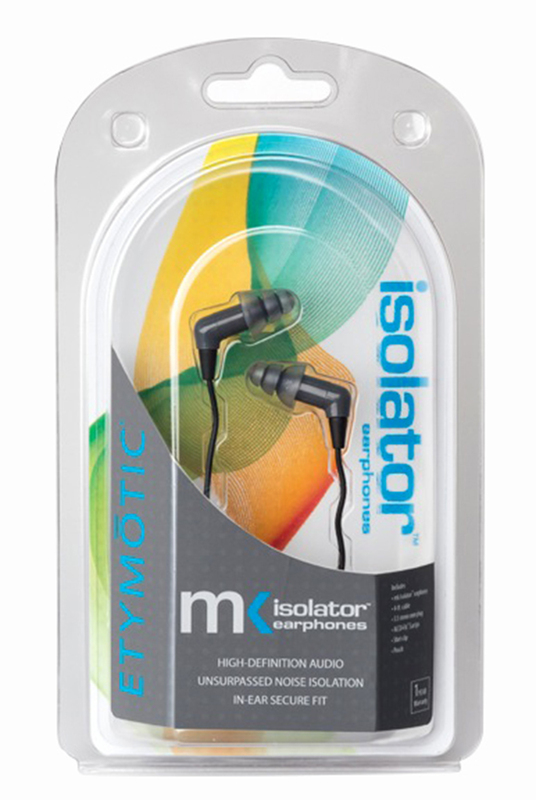 So I was interested in trying Etymotic’s MK5 Isolator Earphones, which are the newest addition to the company’s high-fidelity Isolator earphone series, an extension of its original 6i earphones. With an attractive $64.95 retail price, the low profile earphones fit nicely in the ear and can be used comfortably under hats and helmets. The affordable MK5 was created to try to get as close as possible to the sound of the Etymotic’s top-end ER4PT earphones – at around a fifth of the price. This was accomplished by using a conventional dynamic driver, rather than the balanced armature ones used by most top-end earphones. The dynamic driver mimics high-end drivers by inserting a proprietary acoustic side-branch to redistribute energy, smooth the peaks and compensate for weak highs. To test out this technology, I took the above-mentioned iPod and the earphones to my crowded (and noisy) beach club. Though the noise there wasn’t as bothersome as the sound of a 777’s engine, it was enough to interfere with the pleasure of listening to the books and music on my iPod. I booted up the new John Grisham audiobook—and listened. So far, so good. The narrative was crisp and clean with no interference from the chattering crowds around me. Next I tried some Andrea Bocelli, and the music was surprisingly rich and accurate for headphones of this size and price; and it was delivered without background noise of any kind. Bottom Line: The Etymotic MK5 offers a lot of bang for the buck and is probably the best set of noise isolating earphones available for less than $100. Included in the package are a carrying case, shirt clip, cable slider, foam tips and three sets of tips in different sizes to ensure a perfect fit. Etymotic is a research, development and manufacturing company that designs high-fidelity audio products and hearing wellness solutions to assess, enhance and protect hearing. Founder Dr. Mead Killion, an audiologist, engineer, inventor and jazz musician, leads Etymotic’s engineering team. Together, audio engineers, musicians and audiologists at Etymotic have generated over 100 patents issued and pending. Etymotic was the first company to develop and patent noise-isolating, high fidelity in-ear earphones. Etymotic’s earphones and headsets have the highest response accuracy of all in-ear earphones and headsets. Etymotic is the only company that publishes accuracy scores. Best Sound Accuracy–Etymotic’s earphones have the highest response accuracy of all in-ear earphones. Best Noise Isolation–Etymotic’s earphones have the highest noise isolation of all earphones. Reduction of outside noise lowers the risk of listening at unsafe levels. For more information about Etymotic, its hearing wellness mission and its products, visit the website.